Greetings friends and welcome to another Easter post. This is an altered egg from the Dollar Tree. Isn't it beautiful. It was spray painted with pink spray paint. Then Modge Podge was applied with a paint brush and chunky glitter sprinkled all over. Just love how these turned out! And, look what was on the inside. These cute tags with those fuzzy peeps you can find at Michael's. Don't you love these peeps with there little Easter Bonnets! It tickled me so much to finally be able to use these peeps on a project. Here's another altered Dollar Tree Egg in a blue colored configuration. You can see the pretty pearls and leaves used to decorate these eggs. It was a blessing to be gifted a box of Bridal shop extras from my friend. The Roses were created with a Marianne Creatables Rolled Rose die. Distress inks were used to color the ribbons for a beautiful match. Here's what was inside this egg. Aren't they cute. This is a cute little bunny die that holds a Reese's peanut butter egg. They are just adorable! One more to show you. 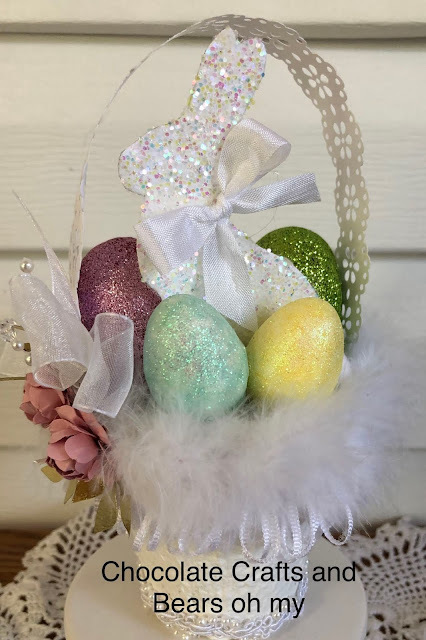 There are just so many ways you create you beautiful altered Dollar Tree eggs. It was such fun creating and hope you give it a try. These were the bunnies inside the pink egg. Thanks so much for stopping by today. I sure do appreciate it. I am back in the craft room. I will have a House Warming project to share with you soon. Until next time, Happy Crafting. Hugs and Blessings! Hello friends. Hope you all had a wonderful Easter. 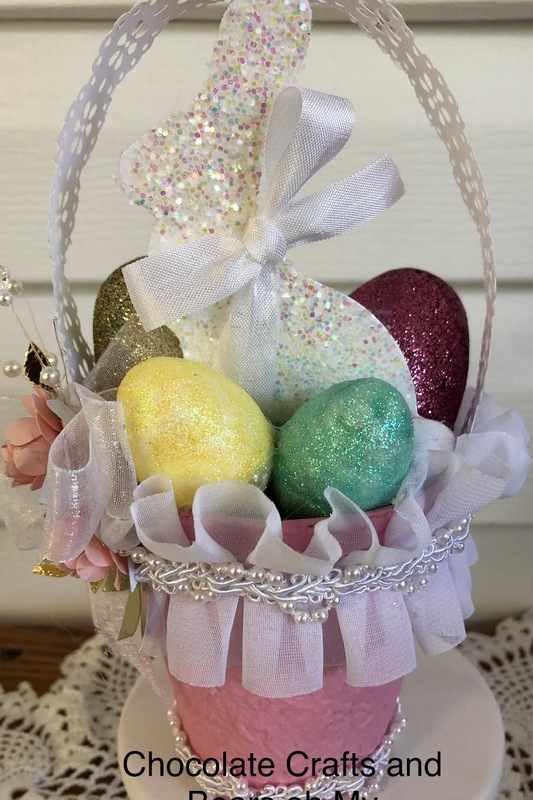 Today is a share of Easter Baskets created from Disposable Peat Pots you can find at Walmart. They are fun and inexpensive to alter. As you can see, there are many ways to decorate and paint these fun peat pots. 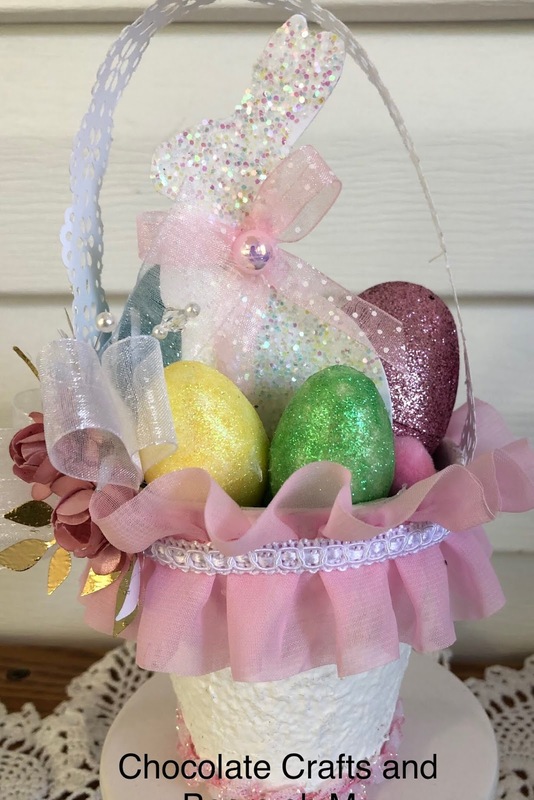 The eggs inside the basket come from the Dollar Tree. 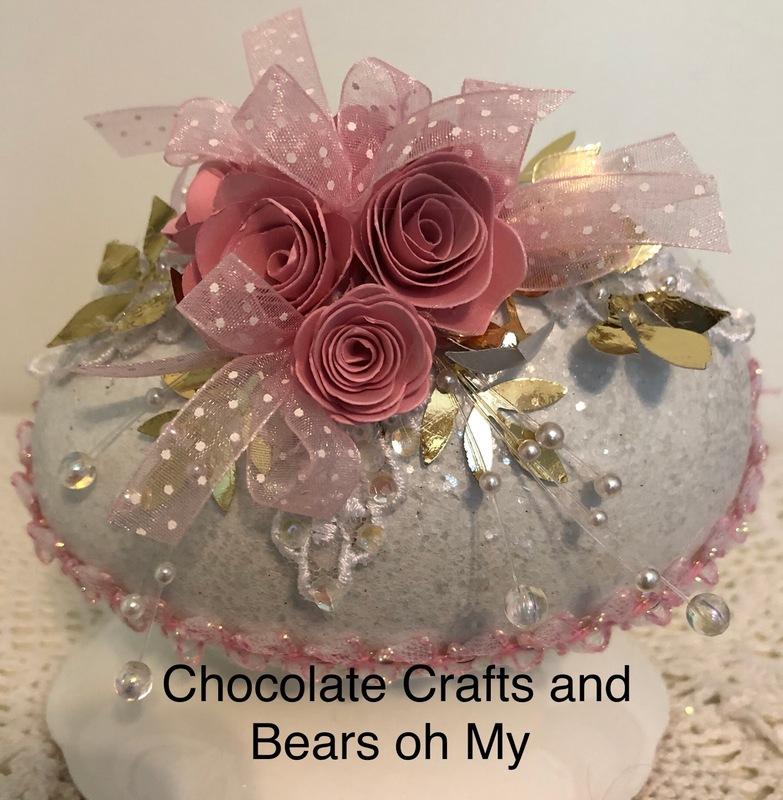 This pot is painted pink and decorated with trims from Hobby Lobby. This pot was painted white and decorated with trims from Hobby Lobby. The handle on the baskets were made from a Martha Stewart punch. This basket features a fun fur trim. 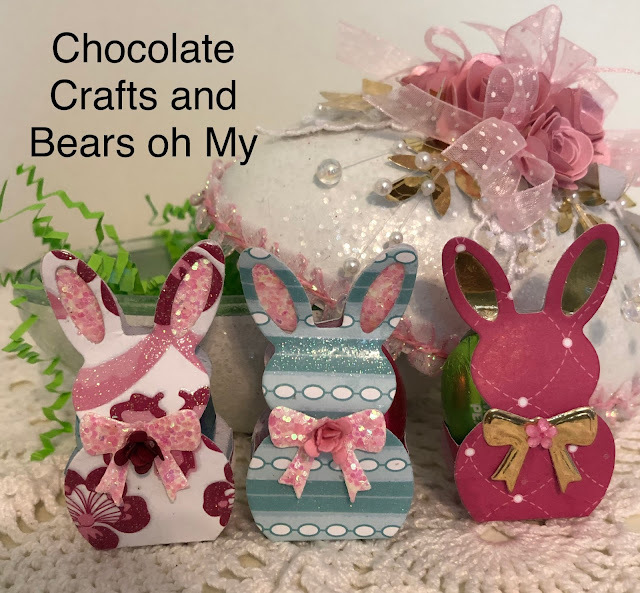 The Bunnies are a Tim Holtz Sizzix die that was cut on heavy white cardstock and had glue applied to hold that beautiful chunky glitter you see. Thanks so much for stopping by today. As you can see, I am trying to be better at updating my blog this year with new projects. 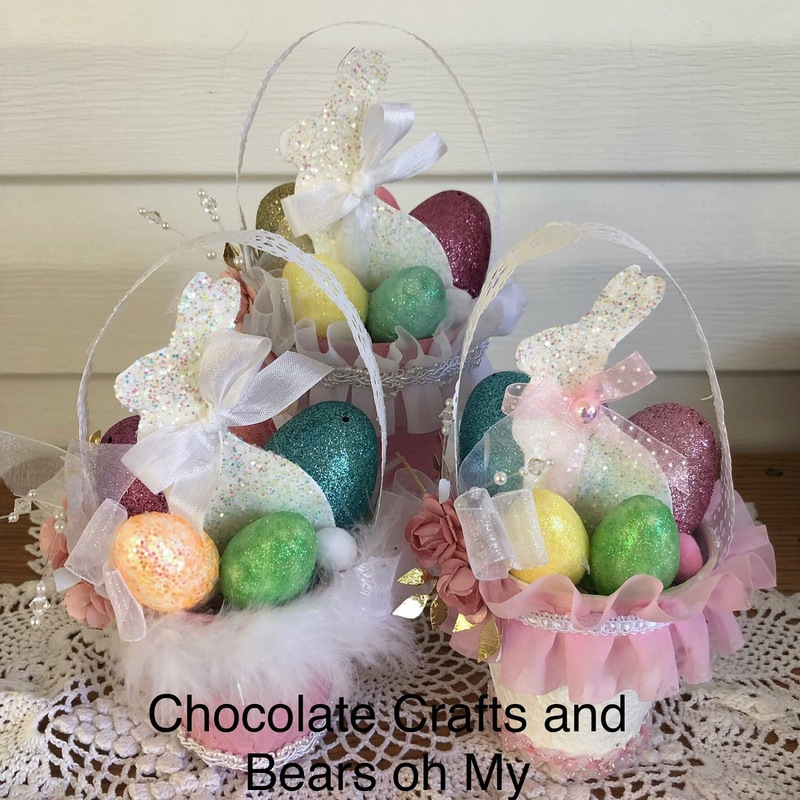 Be sure to come back tomorrow as I have another fun Easter project for you. Until next time, Happy Crafting. Hugs and Blessings!!! Hi everyone. Here is a close up of the Bakery that was created for the Loaded Envelopes Galore and More Facebook swap you can find here: https://www.facebook.com/groups/LoadedEnvelopeOriginal/. 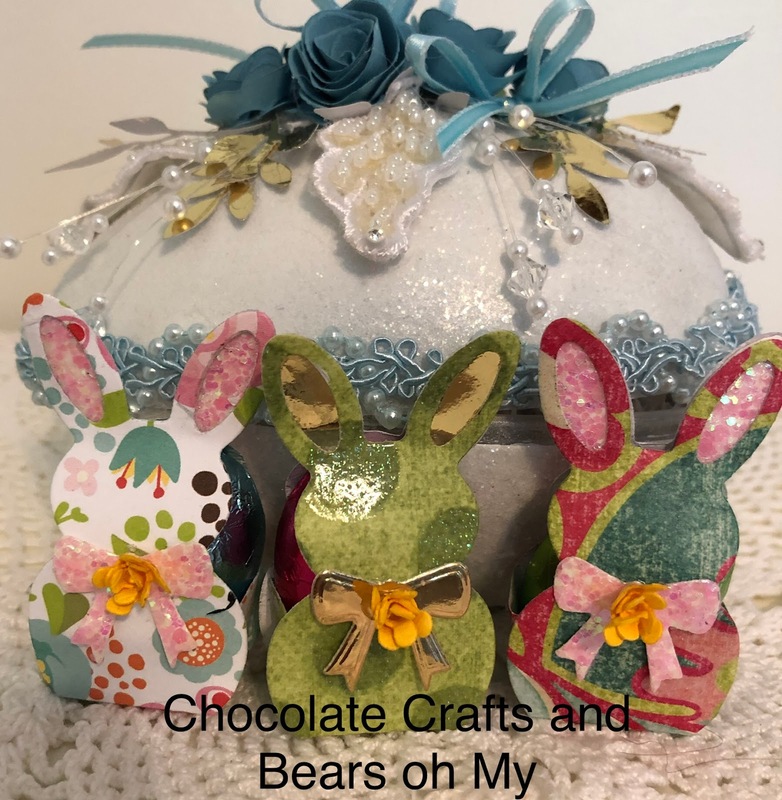 For the month of April I am the Guest Designer for the swap. I created this project for us to swap. Isn't it fun!!! This box is large enough to use your window dies that you might have in your stash. If you don't have any, I show you in the tutorial how to create the door, steps, roof, and windows. You only need a score board and a paper cutter. It's simple. You decorate as you wish! This is the backside of the Bakery. It's decorated with pearls and swirls as I was going for a Shabby Chic look for this house. There are so much themes you can do with this house. I am currently working on a "Coffee Shop" as I intend to fill it with Keurig (K Cups) as a gift presentation. See, isn't that fun!!! You could do a Flower Shop and include flower seeds inside!!! The letters for the Bakery Sign were done on a Circuit machine. The rolled Roses are a Marianne Creatables die. 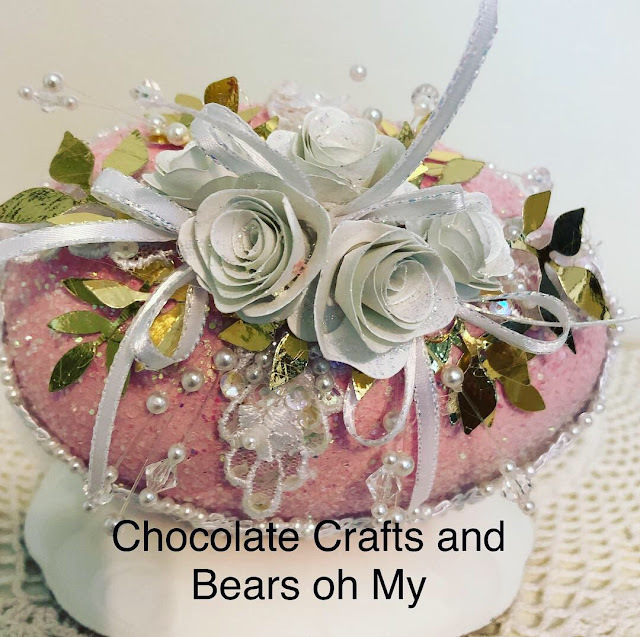 Thank you so much for stopping by to view my project. I have included the tutorial below. I would love to see your houses. I will be posting pictures of the embellishments that are included in these houses soon. So check back. Until next time, Happy Crafting!!! Hello friends and crafters. 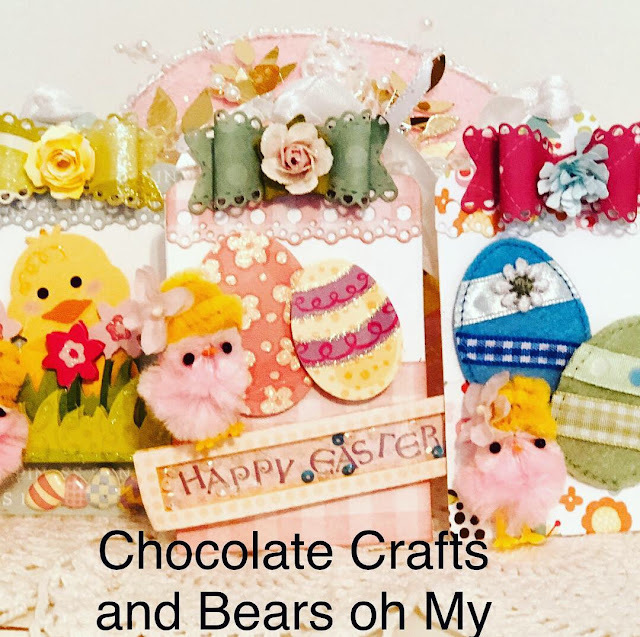 I am pleased to announce that I am the guest designer over at the Loaded Envelopes Galore and More for the month of April. Please come and check us out here: https://www.facebook.com/groups/LoadedEnvelopeOriginal/ These houses measure 7" high, 5" wide, and 3-1/4" deep and perfect for "loading". Gosh so much you can do with these. I can imagine putting some cookies inside to bring to a new neighbor for a welcoming present. Or how about bringing one of these houses loaded with candles inside as a hostess gift. Wouldn't this be cute to present at a house warming, or how about a bridal shower with Bath and Body Works products inside. Your imagination is the limit. Here is the tutorial for putting one of these together. All you need is a Score Board and a Paper Cutter and you can create a house. How fun is that!!! Your window dies in your stash are going to work on this house as you have a lot of real estate. If you don't have any, I show you how to make the windows and window boxes as shown on the "Red" house. Wouldn't this be great with your recipients last name on the house like as shown on the "Bakery". Wow, they would proudly display that in their home!!! The roof on this house was done with a Martha Stewart Punch. The house was created with a Sizzix Tim Holtz Embossing Folder that looks like Bricks. I used distress inks on white paper to achieve this look. This is the back of the house. The fence is a die from my stash, but I know there is a Martha Stewart punch that does a fence as well. The tulips are from an Elizabeth Craft Designs die and so are the tiny flowers in the window boxes. You could use a tiny punch from your stash for those as well. 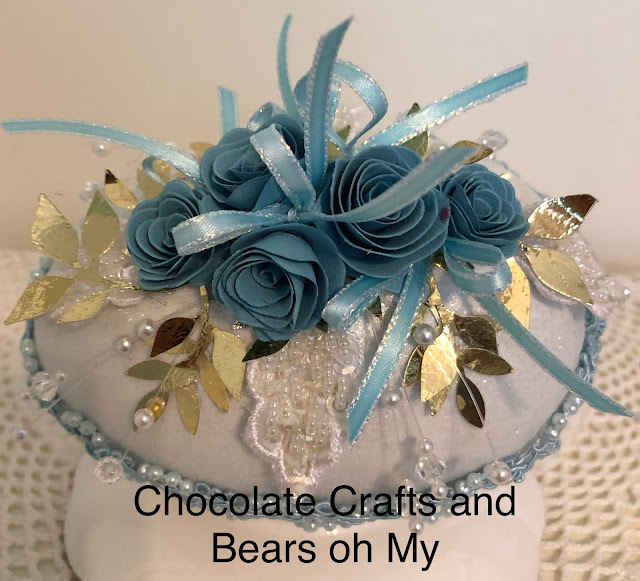 Thank you for stopping by to view my project. I will be back tomorrow with close up pictures of the Bakery. I will also take pictures of the embellishments that I loaded my doll house with to show you how much you can stuff in there!!!! Until next time, Happy Crafting!!!! Hello friends!!! So here I am again with another one of these cards. It's a Spellbinders 3D Vignette die. I love these dies. Pair it with a Gorjuss Girl and it will melt your heart. Don't you just love that sweet little kite shaker too!!!! This was the card I sent with the Happy Mail that I themed "Kindness". I have a couple more things to post and I will be moving on to some Christmas, then Halloween and Fall projects. Thank you so much for hanging with me today. I have so much to share. These days I am pretty busy with a full time job, taking care of my little Granddaughter, and keeping up with the laundry, cooking, and housework. You don't know how much I appreciate you. Until next time, Happy Crafting. Just a little share today of this sweet little purse from Tonic Studios called Kensington Handbag die. It's as sweet as it can be and it is a good size. I fit two little drawstring bags inside. This was part of my Happy Mail "Kindness" theme with Gorjuss Girls. The little daises are a Sizzix-Susan's -Susan's Garden Collection - Thinlits Dies -Flower, Mini Daisy. Thank you so much for stopping by today. Hope you enjoyed this little share. Still trying to catch up on my post. Stay tuned for more projects. Until next time, Happy Crafting.